Danish gaming peripherals company SteelSeries has announced the appointment of a UK commercial team and a second UK distributor as it aims to grow its market over here. 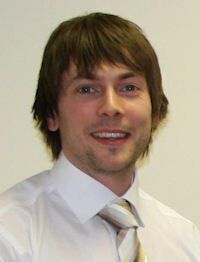 Chris Elt (pictured) is the recently appointed UK sales manager, while James Dean is handling the marketing and PR. Elt had worked at distributor Realtime until last March, but decided to partner Enta Tech as a distributor for SteelSeries. It's probable that Realtime's partnership with rival gaming peripherals brand Razer will have played a part in the decision. Enta joins incumbent distie Interactive Ideas, which was already working with gaming keyboard maker Ideazon when SteelSeries acquired it in July 2008. "We've seen substantial growth in the UK professional gaming arena," said Steen Ronholt, SteelSeries sales VP. "We know the SteelSeries brand already has a strong UK audience thanks to the close knit online gaming community, however until now, there have been few places to purchase. With Enta Technologies as our new distributing partner, we are really able to tackle the UK market." Elt has actually been working with SteelSeries since last August, and we've learnt that he was behind a deal that has seen a full range of SteelSeries products on the shelves at branches of PC World. While SteelSeries plans to continue with its emphasis on engaging with the online gaming community, it will also be hoping to drive its growth in the more mainstream market - hence deals like the PC World one. Here's a gratuitous shot of a glamorous gamer using SteelSeries gear. AMD says the channel is in good health MSI announces incentive scheme for indie channel SteelSeries announces range of Fnatic gaming peripherals QOTW: Which mouse do you use for PC gaming? QOTW: Which keyboard do you use for PC gaming?